On November 25 and 29, 1941, Einsatz­gruppe 3 (Special Task Group 3), one of many SS (Schutz­staffel) mobile death squads oper­ating behind the front lines, mur­dered 5,000 “Reich Jews,” that is, Ger­man- and Austrian-born Jews. These men, women, and chil­dren had arrived in the Baltic ghetto at Kau­nas, Lithu­ania’s second largest city, earlier in the month. On this date in 1941, in the Rum­bula Forest 9 miles south of Riga, capi­tal and major city of the Baltic state of Lat­via, the first of two sets of even more horri­fic mass murders began. (The second set occurred on Decem­ber 8.) Roughly 24,000 of the vic­tims were so-called (by the Nazis) “unpro­duc­tive” (un­wert­voller) Lat­vian Jews from the over­crowded Riga Ghetto, a 16‑block area known as Mas­ka­vas Forštate (Mos­cow Suburb), where 32,000 lived. Addi­tional vict­ims were approx­i­mately 1,000 Reich Jews who had left Berlin two days before on the first of 19 trans­port trains to Riga. Second only to the Babi Yar mas­sacre in the Soviet Ukraine (Septem­ber 29–30, 1941, when Ger­mans and local col­labo­ra­tors killed 33,771 Jews in a single oper­a­tion), the Rum­bula mas­sacre was the biggest two-day Holo­caust atro­city until Nazi Ger­many intro­duced exter­mi­na­tion camps in Poland in 1942. The Rum­bula mas­sacre was carried out by Einsatz­gruppe A, which was assigned to Army Group North commanded by Field Marshal Wil­helm Ritter von Leeb, whose forces had over­run the three tiny Baltic states of Latvia, Lithua­nia, and Esto­nia and began an 874‑day siege of the Soviets’ Baltic port and second largest city, Lenin­grad (part of Opera­tion Bar­ba­rossa). Ein­satz­gruppe A was aided by a unit of Lat­vians known as the Arajs Com­mando and to some extent by Latvian aux­il­iary police. Of the 40,000 Jews living in Riga (about 10 per­cent of the city’s popu­la­tion) when the Ger­mans in­vaded the Bal­tic states in July 1941, only 4,800 were still alive by the end of the year. By late 1943 almost all Lat­vian Jews (out of approx­i­mately 66,000 at the start of the Nazi occu­pa­tion) had perished in further SS “actions” (the Nazi euphe­mism for mur­der; for example, in gas vans), or had been worked to death in Latvia’s infamous Salaspils con­cen­tra­tion camp, 11 miles from Riga, or had been trans­ported to other concentration and death camps. 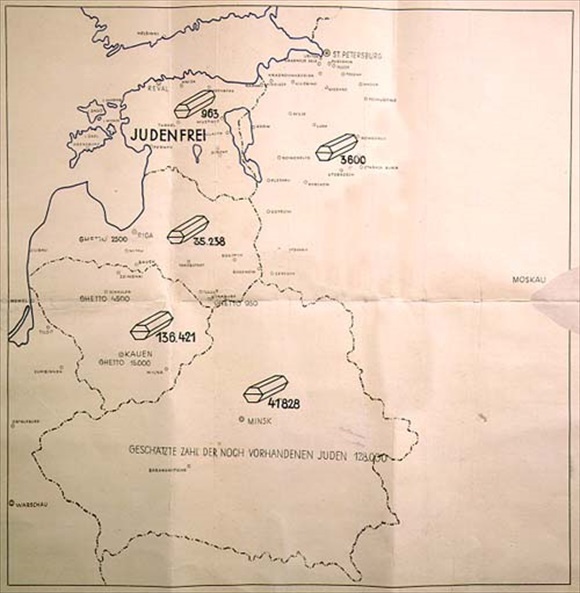 Above: Sketch map of Baltic States and East­ern Europe used to illus­trate SS-Brigade­fuehrer und Generalmajor der Polizei Dr. Franz Walter Stahl­ecker’s report titled “Jewish Exe­cu­tions Carried Out by Einsatz­gruppe A” and stamped “Secret Reich Matter.” The report was sent to Stahl­ecker’s superior, Rein­hard Hey­drich, chief of the Reich Main Security Office (which included the Gestapo), on Janu­ary 31, 1942. The map sum­ma­rized the num­ber of mur­ders com­mitted by Stahl­ecker’s SS unit in the Baltic states and the Soviet Union in 1941; namely, 220,250. The legend at the bottom states that “the esti­mated num­ber of Jews still on hand is 128,000.” Esto­nia in the north is marked “juden­frei” (free of Jews) (963 killed); Latvia (35,238 killed); Lithu­ania (138,421 killed); Belarus (41,828 killed); and Russia (3,800 killed). 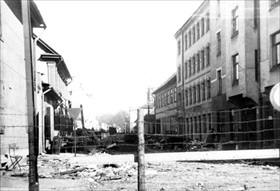 Left: Riga ghetto in 1942. After the mass killings at Rum­bula and the liquida­tion of the so-called “large ghetto,” Lat­vian sur­vi­vors moved into a smaller ghetto, which also housed deported Reich Jews from Ger­many, Aus­tria, and today’s Czech Republic (Bohe­mia and Mora­via). Its barbed-wire peri­meter was guarded by Lat­vians. With­in the smaller ghetto, the Ger­mans main­tained a special com­pany of guards, con­sisting of police­men from Dan­zig, today’s Gdańsk in Poland. Jewish Coun­cils (pl, Judenräte; sing, Juden­rat), one for the Lat­vians and one for the Ger­mans, were set up to work with the Ger­man occu­pa­tion autho­rities (Gestapo and Wehr­macht). A Jewish Ghetto Police force was also estab­lished for each com­mu­nity. The Nazis set up a Labor Autho­rity, which liaised with the Juden­räte. Every morning the work crews assem­bled in the streets according to their work assignments. 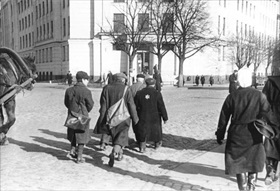 Right: 1942 photo showing Jews in Riga wearing the required yellow six-pointed star, one star visi­ble from the front, the other from the back (man in long dark coat). Jews were for­bidden to use the side­walk and street­cars and were banned from public places, including city facili­ties, parks, and swim­ming pools. A Jew was also allotted only one-half the food ration of a non-Jew. Nurem­berg-style race laws were intro­duced governing marri­age and employ­ment, and Jews could be ran­domly assaulted with impu­nity by any non-Jew. An account from the year 1943 lists 13,200 Jews in the Riga ghetto. By the end of Novem­ber 1943, all Jews had been removed, either by trans­port to a con­cen­tra­tion or death camp (2,000 to Auschwitz on November 2, 1943) or by murder.